Boracay residents and tourists joined hands to form a seven-kilometer human chain along its world-renowned white sand beach to celebrate the first anniversary of the Boracay Beach Management Program (BBMP) last 24 September 2011. BBMP is a multi-sectoral initiative for the protection, sustainability and enhancement of the island's coastal and marine resources. Boracay human chain for the environment. 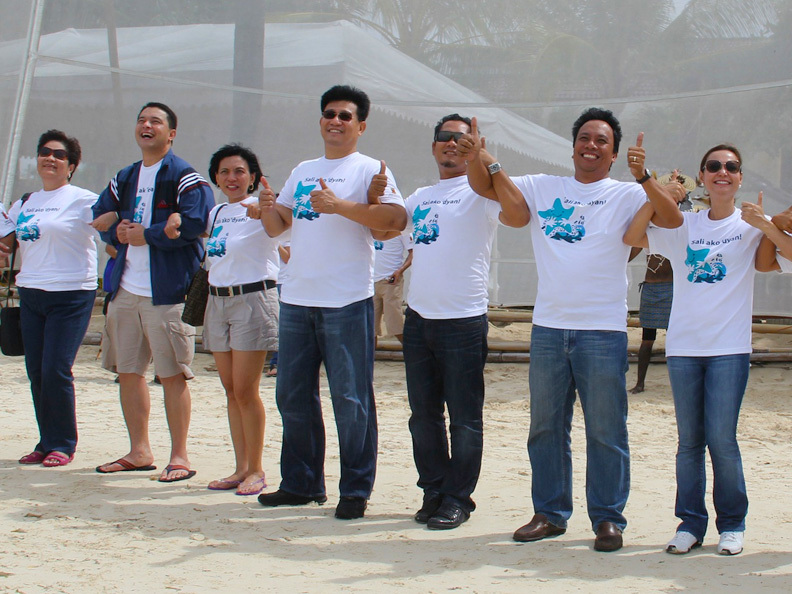 (L-R): Petron Foundation general manager Malu Erni, Environmental Management Bureau director Juan Miguel Cuna, Mrs. Jojo Paje, DENR secretary Ramon Paje, Malay Mayor John Yap, presidential adviser on environmental protection Nereus Acosta, and Mrs. Abby Yap participate in the 7-km human chain along Boracay's beach front to mark the 1st anniversary of the Boracay Beach Management Program (BBMP). Aside from the human chain, the anniversary program also included the launch of the Adopt-a-Tree program in Boracay, which aims to plant 30,000 seedlings in the island within one year. To jumpstart it, nearly 2,000 seedlings were distributed to Boracay high school students and foresters who pledeged to plant these trees in their backyards and school grounds. This was followed by a clean-up drive to highlight Boracay's anti-smoking and anti-littering campaign. One of BBMP's convenors, Petron Corporation, contributed to the environmental protection drive by providing free emission testing for public utility vehicles at the Petron service station. As witnessed by DENR Secretary Ramon Paje and Environmental Management Bureau (EMB) Director Juan Miguel Cuna, Petron's Carbon Flush product demonstration resulted in a dramatic reduction in smoke emission values from 3.753 to 0.399, or an improvement of almost 90%. Key members of the champion Petron Blaze Booster team, including most valuable player Arwind Santos, were on hand to add star power to this activity and the rest of the anniversary festivities. Malu Erni, general manager of Petron Foundation, which introduced the globally-recognized Integrated Coastal Management to the BBMP, reaffirmed their organization's commitment to provide resources and expertise for long-term sustainability. To encourage the youth sector to strengthen its support for BBMP, San Miguel Corporation (SMC), another staunch supporter, introduced a star-shaped mascot to embody the slogan "Sali Ako Dyan! ", paving the way for the next stage of BBMP's advocacy. Petron and SMC, in partnership with the Province of Aklan, the Municipality of Malay, and the Boracay Foundation Inc. (BFI) launched the BBMP and the "Para Sa Boracay Ako! 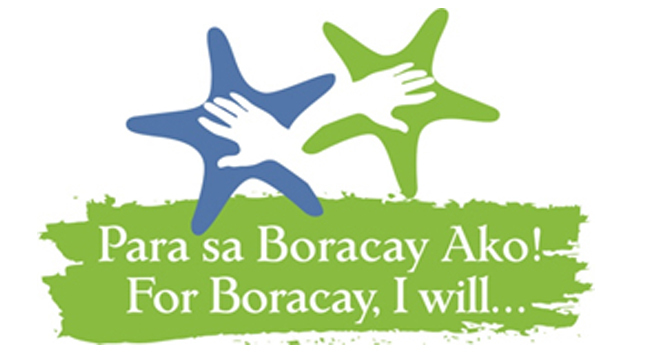 For Boracay I Will" advocacy in 2010 to engage the island's various stakeholders in an integrated program that would ensure the island's environmental sustainability.